Encouragement. It's more than a compliment or a pat on the back. According to Drs. Larry Crabb and Dan Allender, it is the most basic form of counseling -- a skill that can be mastered by laypeople as well as counselors. What must we know in order to fulfill the biblical exhortation to 'encourage one another'? 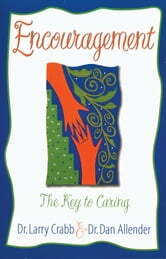 Encouragement: The Key to Caring tells you. Part one deals with understanding encouragement, and part two explores the process of encouragement, including such practical how-tos as - developing a careful selection of encouraging words - cultivating active listening skills - using biblical fellowship to move beyond superficial smiles and shallow greetings - recognizing subtle opportunities for encouragement -- Without the encouragement of a caring community, biblical truth taught in church tends to just thicken people's defense layers. But authenticity, freedom, and greater love for God and others are the fruit of encouragement, and evidence of the tremendous power God invests in individuals and churches who practice it. Are You Really Ready to Be a Wife?